Around the year 1908 several farmers from the surrounding area of Heino, Lierderholthuis and Laag Zuthem put there heads together; They were unhappy with the prices of the local mills. They formed the idea of starting their own mill. This lead to the foundation of the “Co-operative grain mill De Voorzorg”. 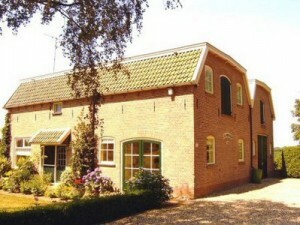 One of the members bought a piece of land where in 1909 the mill “De Voorzorg” was built. The name “De Voorzorg” translates into “The Precaution”. The mill was given this name as it was built as a precaution to avoid the high prices of the privately owned grain mills. Unfortunately the mill wasn’t a great success and after only a few decennia the co-operation went bankrupt. The mill was bought by another, privately owned, mill. In the crisis years of 1930 till 1935 the mill was mainly used as a grain storage facility for the government. In the 1940’s a young couple moved into the residential part of the building. In the following decennia 14 children were born in “De Voorzorg”. In 1986 the family Van der Bent bought the building. In 2006 a part of the former mill was remodelled into a luxury holiday cottage.